Your vehicle may be strictly utilitarian, getting you from point A to point B, going to work, chauffeuring children to school or other activities, or it may represent a sense of freedom – the open road and the ability to come and go as you please. According to the Pew Research Group, 88% of American households have a car, proving that a vehicle is not just a luxury but in most areas, a necessity. Luxury or necessity, owning a car is expensive – in many cases a major part of a household budget. Some financial experts recommend that your monthly vehicle expenses, including payments and other costs, does not exceed 15% of your monthly household budget. When deciding how much you can afford to comfortably spend on vehicles, remember that the true cost of owning a car is so much more than your car payment. When determining the type of car you can afford, you also need to consider things like gas, taxes, registration, insurance, and maintenance/repairs. Routine maintenance typically consists of regularly scheduled things like tire rotations, oil changes, tuneups, and filter replacements. Repairs are unscheduled, such as brakes, batteries, engine, and exhaust systems. 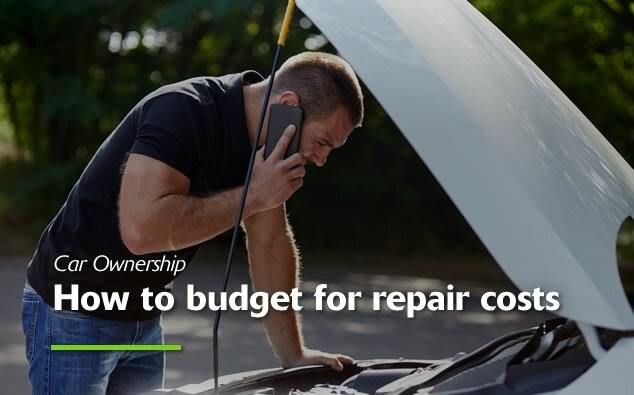 Many repairs could be covered on new cars by a warranty, especially during the first few years, but after the warranty expires, it’s important to add these items to your budget. Dealership or independent mechanic. This is a personal decision – and both choices have pros and cons. Dealerships could be more expensive on certain repairs, but their mechanics are likely certified and up-to-date on your particular vehicle make. Independent mechanics may be less expensive and able to work on more makes and models, but most will not have the same certifications. Repair or replace, the 50% rule – many people believe that if a repair costs more than half of the car’s value, that you are better off to replace the vehicle. Ask for referrals – it’s easy in today’s world of social media. Simply ask your friends or family members for recommendations on auto repair. Get several estimates. It may take more time, but getting estimates from more than one place will help you feel more confident that repair is necessary and that the price quoted is fair. Ask about a warranty – on parts and labor. Repair costs for vehicles vary greatly depending on the make, model, and year of the vehicle, however a good average to factor into your budget is around $100 a month for each vehicle. Edmunds.com provides a tool to help you calculate a true cost to own your specific vehicle. This tool, and others like it, may give you a better idea of the hidden costs of car ownership. Visit our website to learn more about all of our personal risk management solutions for your auto, home and life.